I'm beginning to think there is a 'pumpkin of the week' trend starting here. 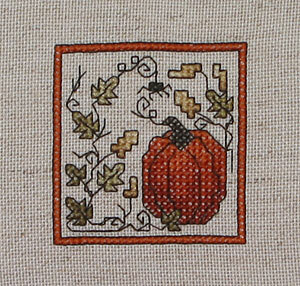 This is the "Pumpkin on Gingham" design from the Halloween ornaments in Just Cross Stitch magazine. 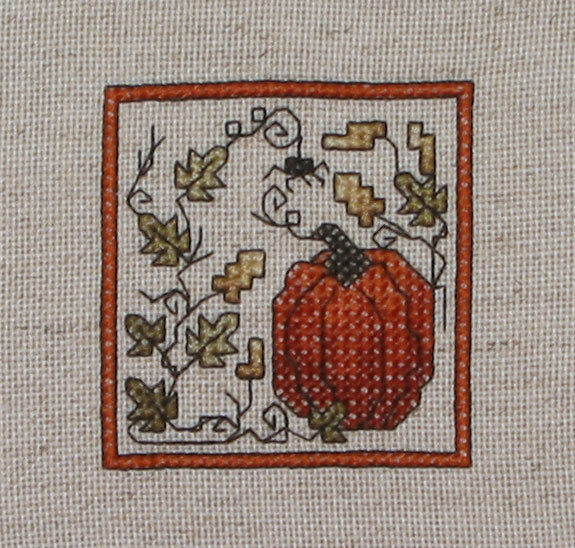 Obviously I didn't stitch it on gingham, but I did use up another little square from the 2 yards of that natural 28-ct evenweave I bought a while back. I've used it for a lot of designs since it can have a rustic or papyrus look to it, but there is still a lot left! I also haven't added the beads yet, since I need to head to the LNS and get them! I'm working some more on Halloween Fairy - specifically the backstitching on her head and shoulders and doing some more of the metallics. Not much progress to show though.